The Carnival Module is ideally suited to schools that are running inter-house or inter-school Sports Carnivals. 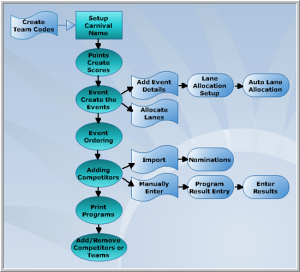 The Carnival Module stores event descriptions along with the timing of the event and any record details associated with the event. Carnival will accept entry of nominations and allow you to print checklists. 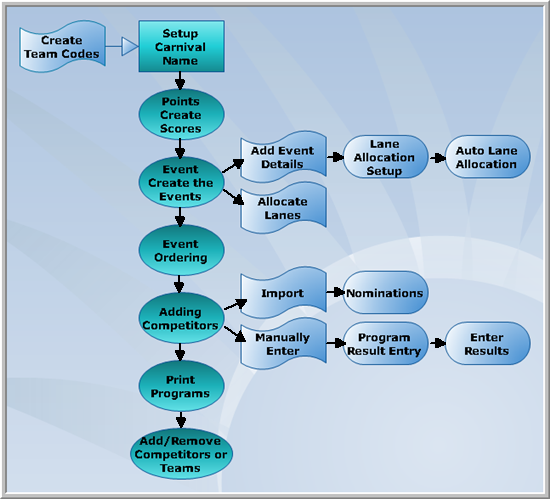 Modifications to competitors can be made virtually up to the beginning of the Carnival. Printed Result reports are available for both Track and Field events. There is also the option of printing a program listing all nominations in lane order. During the Carnival results can be entered and records updated, at the completion of the carnival the program can be reprinted, this time printing competitors in their order of finish. The Carnival can be setup to monitor points awarded and will produce a points listing based on school, house, competitor and age.